Can’t talk or won’t talk? 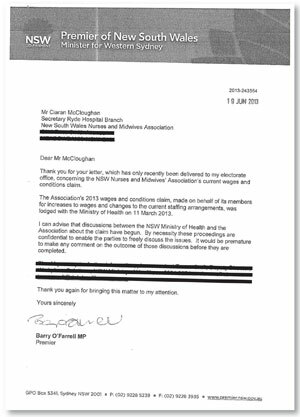 Barry O’Farrell has just responded to letters mailed to him from NSWNMA branches earlier in the year about our campaign. We note the letter is dated 19 June, twenty days after his Government rejected our claim for the second time; twenty days after his Ministry of Health announced it would push ahead with a new Public Health System Award with only a 2.25% pay increase. NSWNMA General Secretary Brett Holmes says improving patient care in NSW will ultimately require political initiative from the Premier. “It is disappointing that Barry O’Farrell has squandered the opportunity to show leadership on this issue,” he said.